It was my friend Jennie's birthday over the weekend and she's only just moved back to the UK. We studied the same course at uni (Business) but she did it with Japanese and then lived there. 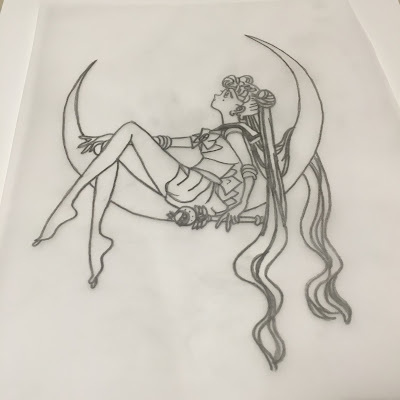 I wanted to make her something really special for her birthday so I chose to do a Sailor Moon design. I love drawing manga anyway so was excited to recreate this on wood. The hearts I use are only £1 from The Works (or if you buy online, you can get 5 for £3.99!) and they are the best to use because they're made with pure wood. You can't burn on MDF. I traced on the reverse of the tracing paper and then transferred the design to my wooden heart by scribbling over again with pencil. I'd recommend securing your design with masking tape so it doesn't move about! I was really pleased with the finished design - and just how detailed you can draw with my new wire point machine. And Jennie loved her present!